Click the picture to look inside ! 9 Refurbished letting Bedrooms with en-suit – Flat Screen TV ,tea – coffee making Facilities also a large function room for hire with own bar. A choice of Home cooked food from local produce suppliers. 5pm to 10pm Chinese Food available. Enjoy a Chinese meal in the Hotels Dynasty Restaurant. Car parking at rear for residents and public car park across road. The original Black Horse Hotel, dating back to at least 1821, was demolished circa 1900 and the name on the front of the building read “Black Horse Commercial Hotel.” James Dale was the Landlord in 1821 who died in 1873 aged 78. He conducted his house in a way that offended some and pleased many. It was his custom to close his Hotel every night at 10.00 p.m., when he refused to supply any liquor after that hour to anyone in the Hotel. Nearly all of the liquors sold passed through his hands first before they went to the customer, and in defiance of strong protests he would often water it down so that it might not have any “unpleasant effected.” If his customers did not like this sort of treatment, they had the choice of going elsewhere. Despite these eccentric actions, Mr. Dale did a large trade among commercial travellers and others, and was highly respected by all who knew him. 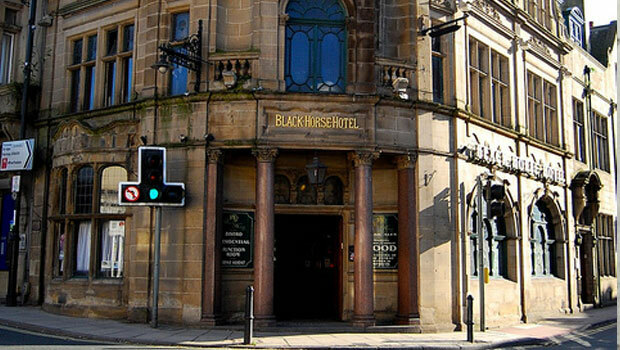 The construction of the present Black Horse Hotel building commenced in or around 1901. Although the date stone shows 1901, it wasn’t until around September/October the following year that it opened. At the time of the opening the hostess was Mrs. Roundell, assisted by Miss Roundell and Mr. Harry Roundell. Around June 1986, Tetleys were instructed by the Council to demolish the large adjoining high wall in Westgate as it was unsafe and the Yorkshire Water Authority were due to drill part of the road up outside the wall. However, as the builders were unable to re-build the archway if it was demolished, they left it standing while removing the remainder of the wall. In 1995 extensive refurbishment took place at a cost of £350,000. The Pub interior was refurbished and the Victorian exterior sandblasted. Barrack Inns briefly converted the pub, which is owned by Enterprise Inns, into an Irish bar called O’Malleys after taking it on in 2010. The company said it had to give up the lease due to “local management problems”. In February 2011 it was announced that new pub managers, Mark McLoughlin and Clare Watson, had taken over the Black Horse Hotel and that the previous leaseholder, Barrack Inns, had planned to start refurbishing the premises but the plans fell through. External work was carried out to repair some of the stonework, and the interior refurbished. Many characteristics from its distant past were retained, i.e. the beautiful ceilings and architrave, bell pushes (although disconnected), and lovely wall tiles adjoining the staircase which were revealed when the property was refurbished in 1995. It now has 11 bedrooms and an upstairs function room, plus the Stables Bistro where customers are welcome to dine. During this period was closed and re-opened on the 22nd April 2011.